Discover this exceptional whiskey of grand quality, Hyde n°5 Single Grain 6 years old has matured for 6 years in Bourbon barrels then has aged for 9 months in Burgundy casks. Discover this irish whiskey with delicate flavours of fruits, vanilla hinted by woody and spicy notes. This whiskey has had a double aging and long maturing process: first for 6 years in Bourbon barrels then a finition of 9 months in Burgundy casks. The Hyde family, originally from Cork, from the same family as the irish president Douglas Hyde, follow a tradition of negociation for over 12 generations. The double maturing process makes their whiskeys original and unique. Hyde whiskeys are known for their quality, indeed, Hyde n°1 Single Malt 10 years has been awarded best Irish Single Malt in the world in San Francisco in 2016. Discover the Irish whiskeys Hyde from the Hibernia Distiller's distillery. A family business for over 12 generations since 1640. Hyde whiskeys are handcrafted and available in small batches. Douglas Hyde was the first Irish president (1938 - 1945). 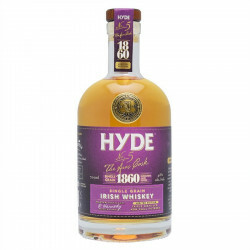 The Hyde No.1 'President Cask' tributes to this man that modernized the country. Located in Cork County, the distillery has a temperate climate for a perfect maturing process. Hyde's secret is in the wood and the choice of the right cask. Hyde whiskeys are non chill filtered, distilled in traditional copper pot still and are double matured, first in Bourbon barrels, and then in either Oloroso Sherry cask or Dark Caribbean Rum cask. Hyde whiskeys are known world-wide and have been awarded several times. Nose: good and spicy with red fruits notes, vanilla and roasted oak. Palate: chestnut, apple and red fruits, honey and orange blossom. delicate notes of honey and chestnut mix perfectly with fruits aromas, red fruit and apple with a hint of orange blossom. Finish: long and silky on plum notes, preserves and spices before woody notes take over.